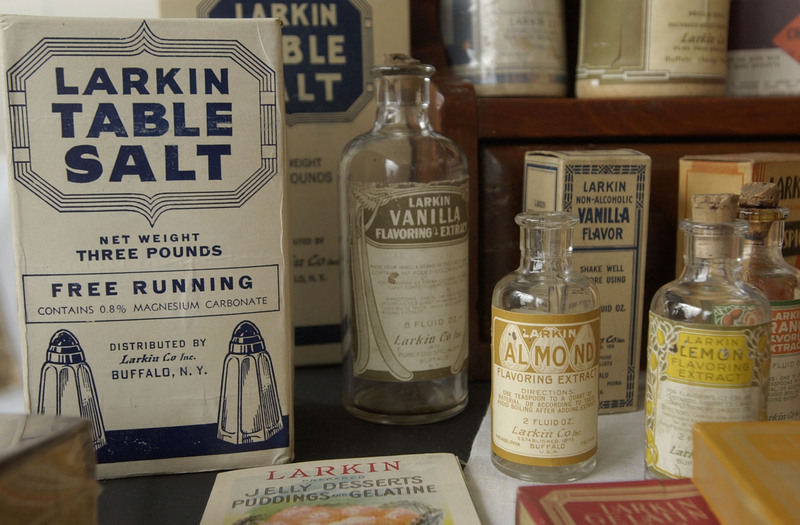 At the turn of the century, The Buffalo-based Larkin Company was one of the nation’s largest retailers, first selling soap, and eventually a range of items — second only to Sears & Roebuck — from its catalogs that reached 1.5 million homes. The money being sent into the Larkin complex near Seneca and Swan streets was unprecedented. It was enough that $4 million didn’t seem too steep when executives, impressed with Larkin Secretary Darwin D. Martin’s Frank Lloyd Wright-designed home, asked Wright to design a new administration building for the company. The structure, the cost of which would be close to $100 million in 2016 dollars, was completed in 1906. At the time, the office space was the latest in modern design. It was lauded by those who appreciated art and architecture around the world, and pointed to as an example of the country’s “coming of age” in design innovation. When an exhibition showcasing three centuries of American architecture moved from New York’s Museum of Modern Art to the Albright (now Albright-Knox) Art Gallery in Buffalo in 1938, Buffalo’s Larkin Administration Building was one of the stars. “It has received considerable praise for the boldness with which the architect cut with tradition in order to bring light into hitherto gloomy interiors,” said one review. 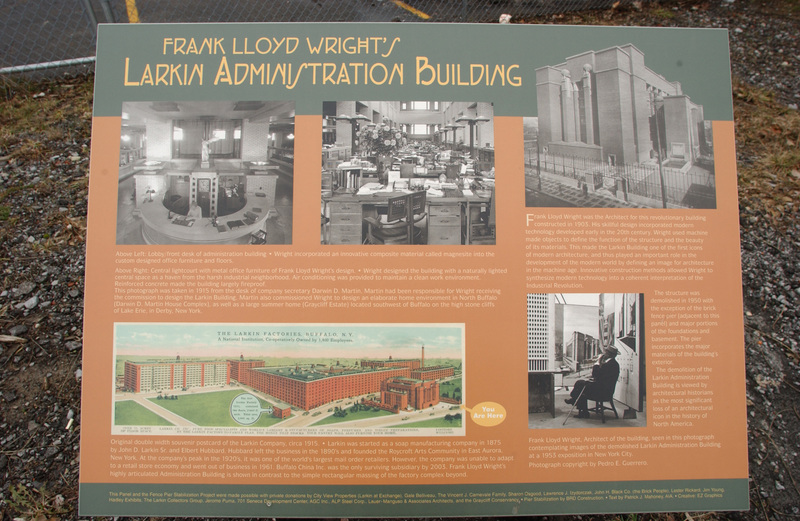 Wright took credit for designing the country’s first metal office furniture for the structure. The design also made it a pleasant place to work, with a mix of natural and artificial light, waterfalls, and a pipe organ all meant to make the day’s toil a bit less burdensome for the everyday Joe working there. It was the jewel in the Larkin crown for 30 years. 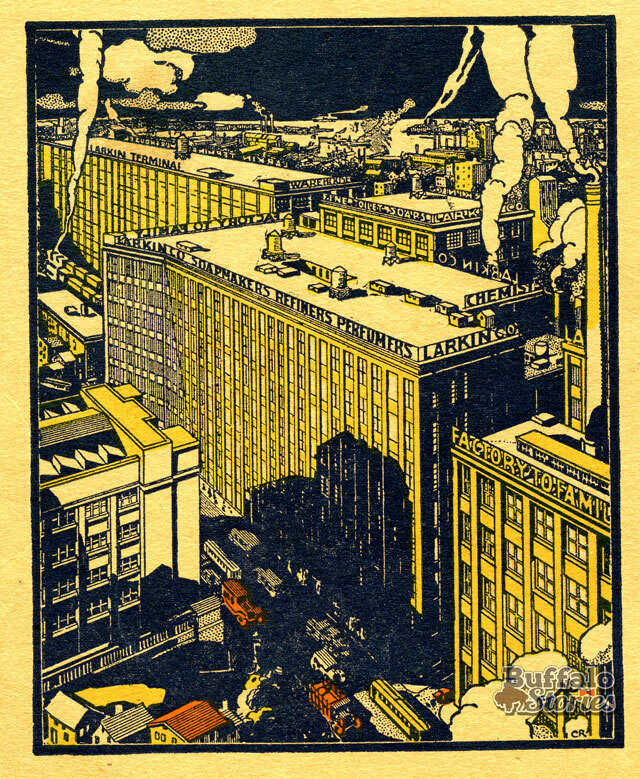 In a gross simplification, through the Depression business dwindled for the Larkin Company. The Frank Lloyd Wright-designed headquarters building, where incoming mail-order cash was once loaded into quickly filled bushel baskets for easy carrying, was renovated into a Larkin storefront in 1939 when the mail-order business died out. Announcements of the building’s conversion mix awe of Wright’s “sensational” and “outstanding” structure, while also bragging of the “modernizing” of the interior — stripping it of most of Wright’s design. Larkin stumbled into the war years. In 1940, Larkin and subsidiaries were $38,000 in arrears to the City of Buffalo for taxes and looking to make payment plans. Three years later, cash-strapped Larkin sold its headquarters building to a Pennsylvania real estate investor, who had hoped to turn a profit with possible federal government interest in the building. The hopes of that out-of-state investor were never realized, and the City of Buffalo seized the building for back taxes. As one of the few open spaces in the city that could accommodate such an enterprise, in 1946 it was hoped that the building might become Buffalo’s new Veteran’s Administration headquarters, but the current Bailey Avenue structure was built instead. Once that plan fell through, the City Council discussed an offer to buy the building — which was assessed at $237,000 — for $26,000. City Comptroller George Wanamaker said the offer was too low, and asked that he be allowed to advertise the building nationally and locally. The council approved $6,000 to advertise the building, although Council Majority Leader George Evans called it “gambling with the taxpayers’ money,” saying that every real estate person in Buffalo knows the building is available. In January 1947, large ads were taken out in a total of seven papers in New York and Chicago, as well as The Buffalo Evening News and the Courier-Express. Three months after the advertising blitz, there were plenty of inquiries, but no bids. Wanamaker also tried to market the 92,000-square foot building to someone who might convert it to housing, but city engineers eventually determined that the site wasn’t appropriate for housing. The state was offered the building as a record storage facility, but the offer was declined. Based apparently more on the structuring of the contract than the money, the Common Council rejected a second offer, this one $25,000, in Jun, 1947. Admitting that the building seemed to have no commercial appeal, Mayor Bernard Dowd offered it to the county, which was looking for space to house some offices. He said the building had “attractive features” for municipal work, but it never came to be. Nearly a year passed before another offer was received. It was again for $26,000, and it was again rejected as too low. A month later, however, a $500 option to buy the building for that amount was accepted. Whether the councilmen who voted to accept the offer knew who the actual bidder was or not is unclear, but published reports named Chestor, Inc., a local real estate company, as the buyer on behalf of an undisclosed client. It was eventually unveiled that the bidder was Magnus Benzing, manager of the Magnus Beck Brewery. While he wouldn’t unveil his plans, he did say they weren’t brewing or housing related. Benzing eventually declined his option, and the building sat empty. During the spring of 1949, Ellicott District Councilman Joseph Dudzick — famous as the inspiration for the gin mill owner in his son Tom’s “Over the Tavern” plays — proposed the Larkin Administration Building be transformed into a recreation center. It was another idea to save the building which never made it past the proposal stage. 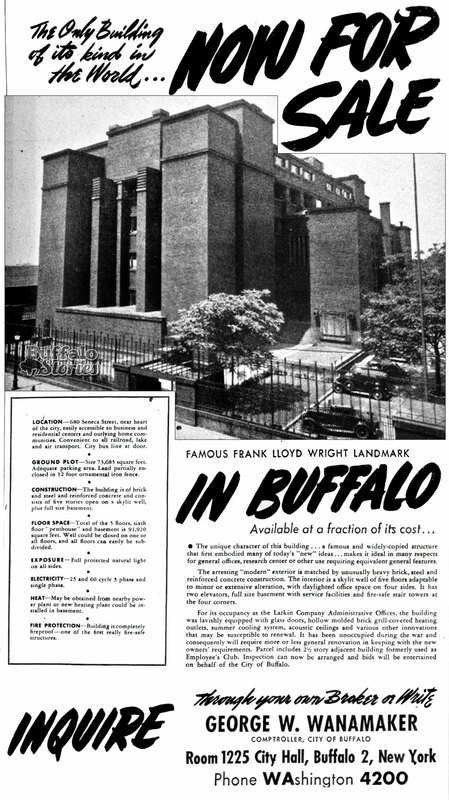 On Sept. 13, 1949, the Common Council voted to sell Frank Lloyd Wright’s Larkin Administration Building — once the most modern office building in the world — for the sum of $5,000, with the knowledge that it was another unknown bidder’s intention to demolish the building and then replace it with a new structure to add back to the tax rolls. Immediate reaction to the sale to Buffalo’s Western Trading Company was positive. The term “white elephant” and a relieved sigh of “finis” were thrown around, as it was clear the city wanted to be rid of the burden of this building. Unlike his predecessor Wanamaker, new City Comptroller Edward Neider had been doing his best to “dispose of” the property and bring it back to the city tax rolls since he’d “inherited it” upon assuming the office. “I believe the city has made the best possible disposition in accepting an offer of purchase for $5,000,” the comptroller said. Outside City Hall, however, the impeding demolition was panned by architects and architecture historians everywhere, including on the pages of New York City newspapers. While vandals had begun the work of demolishing the building, stripping it of nearly every light fixture, doorknob and plumbing line, the solidly built steel framed and poured-concrete girded building took an agonizing six months and six figures to demolish. 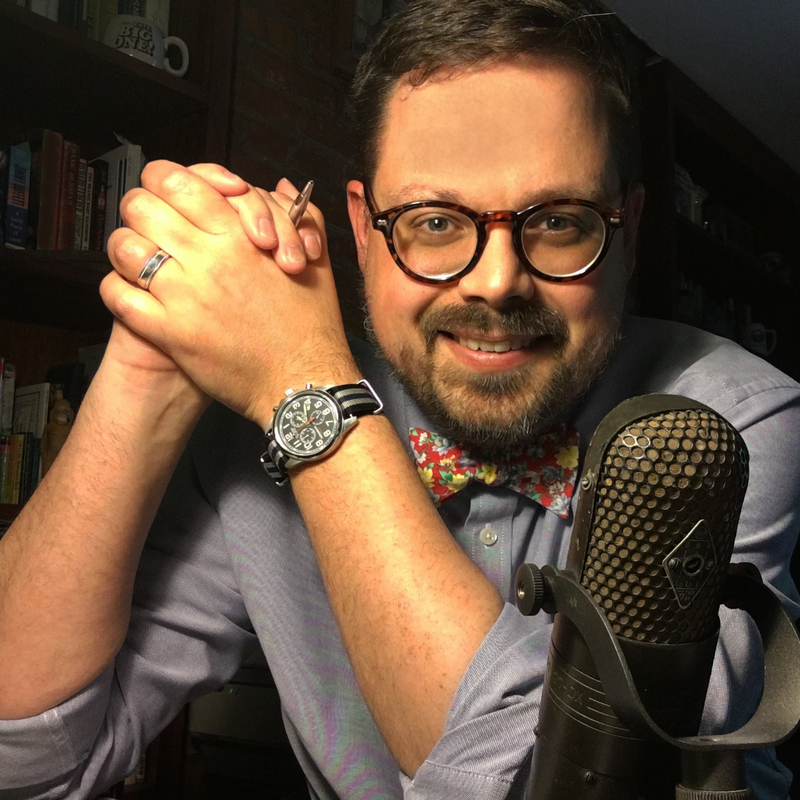 Larkin historian Jerome Puma writes that pieces of “the building that was meant to last forever” do live on, however humbly. Chunks of stone and brick from the building were used to backfill the Ohio Basin, and the 24-inch steel floor beams made by Bethlehem Steel were last known to be holding the earth in place above a West Virginia coal mine. 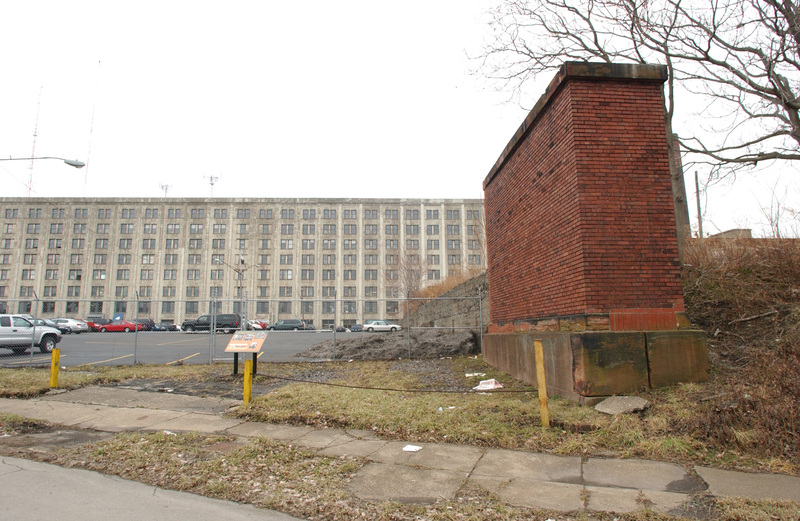 After the world-famous structure was cleared away, Western Trading petitioned Buffalo’s Common Council for a variance to move the truck terminal they had planned for the site, saying in part that the newly opened up land would just be too valuable as a parking lot for the rest of the Larkin complex. The council agreed, and the space remains a parking lot to this day.